Regulated by the Australian Securities and Investments Commission (ASIC), Core Liquidity Markets is an Australian financial services provider based in Melbourne. 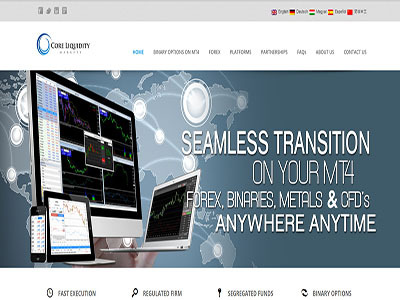 They provide trading services for traders wishing to trade spot forex, Binaries, Precious metals and CFDs. With over 40 years of combined financial trading experience behind the company, Core Liquidity Markets aims to provide an advantageous trading environment for all of its clients, regardless of whether they are institutional or retail traders. With its ultra fast and low latency infrastructure, Core Liquid Markets faster round-trip trade execution services can even meet the trading needs of high-frequency traders. It is also worthwhile to note that Core Liquidity Markets is one of the few brokers around that offer traders the ability to trade binaries directly from a Meta Trader 4 (MT4) platform. Click here to sign up to Core Liquidity Markets and trade binaries for as little as $1 per trade. Currently apart from English, Core Liquidity Markets’ website is also available in Chinese and Spanish. The fact that the company also provides support in Chinese indicates that they aim to target the Chinese speaking market. This is a wise strategic move since China is the second largest economy in the world. Customer support at Core Liquidity Markets is available 24/6 from Sunday (5:00PM EST) to Friday (5:00PM EST) by means of live chat, email or telephone. As for the trading platforms, traders have a choice of the world renowned MT4 platform or the in-house WebTrader trading platform. What is unique about both these two platforms is the fact that binary trading is also supported by them. This helps to simply the trading process should the trader wishes to switch from trading spot forex to binaries. Previously, binary trading required a separate dedicated trading platform which is a hassle in a fast moving and dynamic trading environment like the financial markets. And to facilitate traders who are constantly on the move, Core Liquidity Markets have also provided mobile versions of their MT4 and WebTrader trading platforms which are optimized for mobile devices. For the benefit of professional traders and money managers, they can also opt to use the Multi-Account Trader (MAM/PAMM) application which embedded inside the MT4 platform. The MAM/PAMM application essentially allows the operation of multiple trading accounts simultaneously from a single master account. As for the MYFX console, it is available on a subscription basis and allows traders to get access to a variety of sophisticated trading tools. The range of markets that is covered by Core Liquidity Markets is quite significant. They cover all the four major asset classes and can be traded as futures, CFDs, binaries or spot forex. Apart from the different minimum deposit requirements among the trading accounts, the key differences between them is the leverage ratio as well as the spreads that are payable. The returns on binary options trades at Core Liquidity Markets depend on the expiry time of the trade. For trades with an expiry time of 60 seconds, the returns are 80%. The returns get progressively less the longer the expiry time. Nevertheless, traders can expect a minimum of 60% for trades which expire in one hour. The spreads at Core Liquidity Markets is quite competitive also. For major forex pairs, traders can expect a spread of as low as 0.2 pips which is one of the lowest in the spot forex industry. Click here now to visit Core Liquidity Market’s website.